It's a Colts vs Saints Super Bowl and these Boozecats are prepared. 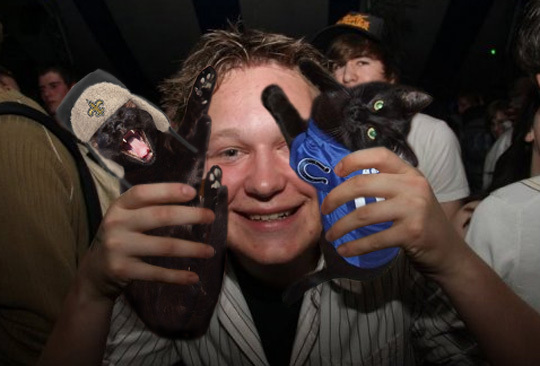 It's a little known fact that Boozecats actually have their own predictors for the outcome of the Super Bowl. Just like the groundhog looks for a shadow to predict how soon spring will be here, two Boozecats in football jerseys have a pizza eating contest and the winner represents the winning Super Bowl team. They've been right about 23% of the time. It doesn't seem like much, but that's double the accuracy of Puxatony Phil.